As farmers grapple with how they will feed an increasing global population, the need to harness data and analytics has become more critical. Changing diets, demand for healthier food options, and decreasing water availability are just some of the challenges that face agriculture today. Combine that with global market volatility and rising input costs such as water, chemicals, seeds, and more and it is harder than ever for farmers to be profitable and sustainable. 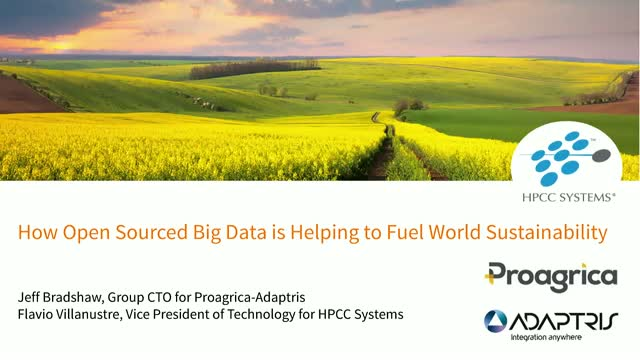 As Proagrica searched for ways to help the agriculture industry use data-driven decision making for crops and livestock production, they decided to adopt HPCC Systems® as their big data partner. HPCC Systems not only delivered a scalable, resilient and secure platform, but it also met their projected future expansion needs. Join Jeff Bradshaw, Group CTO for Adaptris within Proagrica and Flavio Villanustre, Vice President of Technology for HPCC Systems, as they discuss how they implemented HPCC Systems and the Adaptris enterprise service bus to incorporate massive, diverse data sets from within complex, secure environments. Jeff and Flavio will share insights on best implementation practices to deliver clean/quality data, provide data security, and deliver the real-time analytics their customers demanded.